The hardest race you’ve ever run: I’ve run 4 marathons (trained for 5). I’ve run in 5 Ragnars with another one on tap in April. The hardest race I’ve ever run was probably my very first Ragnar. It was the DC Ragnar in Oct 2015 when we had that nor’easter come up the coast and hit us with sideways flooding rain. The night run up and over South Mountain (Leg 18) was pretty ridiculous. Most adventurous decision you’ve made with your running: To run my very first marathon from just running a half previously. Running mentors: Bart Yasso, Shalane, Desiree Linden, Meb, Kara Goucher, Michael Johnson. I follow running pretty closely and am a self-professed running nerd. You’ll catch me in front of my computer screen streaming the Boston Marathon on Patriots Day. I will also watch the London Marathon and NYC Marathon too. I read a lot of what the elite athletes suggest for training and try to follow as closely as I can. My favorite place to run in the D.C. area is: The Mall – between Arlington Cemetery and the Capitol. 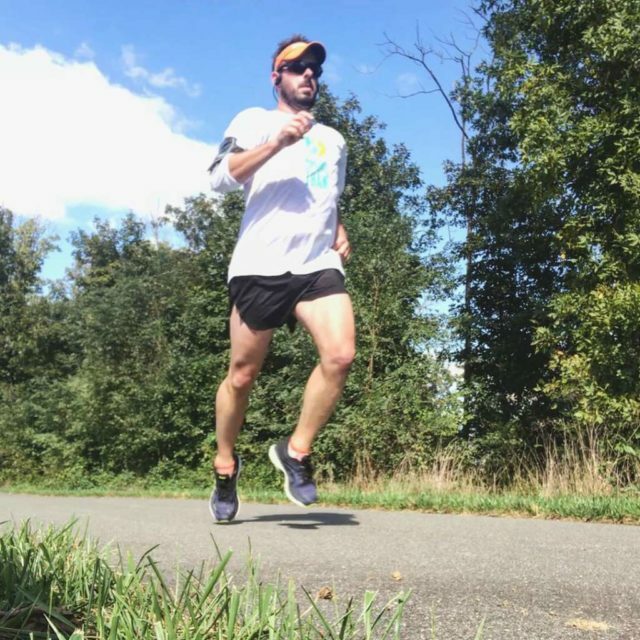 Favorite local race: Rock and Roll – takes me through a different route in D.C. that I don’t normally run. Ideal post-run meal: Breakfast taco! Goals: Run NYC this year. If that doesn’t happen, then PR in another marathon TBD and run 365 days in a row. Your advice for a new runner: Start out slow and find your pace. Oh, and shoes. Yes, they can be very expensive (I often find older models online and save a lot of $$ that way), but if you don’t have the proper shoes, you will quickly find yourself nursing shin splints or something worse. Invest in the shoes – it is worth it. And be up for flexing your runs to later if you just don’t have it in you to run right now. I’ve been finding if I wake up early to get a run in but just don’t have the motivation, I tell myself that I’ll just get it in later after work. Running later is much easier for me than coping with the 0-day guilt. Song in your head during a run: I listen to Pandora and I have a wide-range of musical taste. Sometimes I listen to Daft Punk or Bloody Beetroots. Sometimes I listen to Rise Against. Sometimes I’m up for RTJ or Childish Gambino. Have you dealt with a major injury: Major no. No broken bones or anything. Hip Flexors, shin splints (see my comment above about shoes). A hip flexor issue kept me out of a marathon in 2017. Why is the D.C. area a great place to be a runner: There are a lot of really interesting trails in the D.C. area and you get to run through history. I work in downtown D.C., so on my lunch break, I normally run around the Lincoln Monument, Washington Monument and other sites. On some days, I have to pinch myself that I get to see all of these amazing landmarks that a lot of people only get to see once in their lives.